Click on an image to download a sticker. Fill in this form to receive up to five free Shake & Fold stickers in the mail. We can only mail stickers within the USA and the EU. But if you go to the Downloads tab, you will find camera ready stickers in several different languages. You can print them yourself or have them commercially printed. All sticker requests will be verified. Please check your Spam folder because Shake & Fold will reply from info@shakeandfold.org. How many stickers do you need? 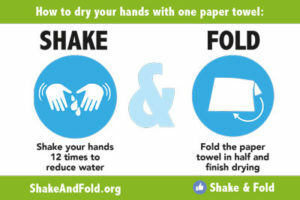 You can receive up to 5 for free; if you need more Shake & Fold kindly requests a donation. Shake & Fold is recognized as a nonprofit organization in the United States. Your donation to Shake & Fold is tax deductible and is greatly appreciated!